Michigan commitment Jordan Poole exploded at the NY2LA Sports Summer Jam as the Wolverine coaching staff hit the road for another weekend of evaluation. 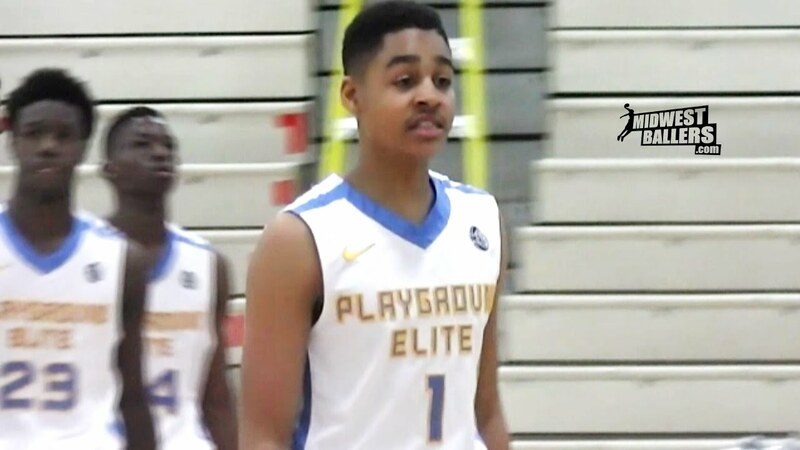 Michigan commitment Jordan Poole was back in action with Wisconsin Playground Elite this weekend at the NY2LA Summer Jam and he impressed throughout the weekend. Poole and Lewis made for a heckuva one-two punch for PGE on the way to the win. The Michigan commit can score with the best of ’em, dropping in 11 points on a small shot count, but showed off his ability to create and facilitate more, doling out 8 assists. Poole has a smooth game. The Michigan-commit is a balanced scorer and passer who can excel in the open floor and the half court. The 6’4” rising senior is able to score from all three levels and has a consistent perimeter shot. Not only does his length help him on offense, but defensively Poole’s length helps him be disruptive. Poole helped PGE to a championship win over Howard Pulley and Poole had 20 points in the title game. Jordan Poole with consecutive triples on Davison. We have a game. Michigan commit Jordan Poole is abusing people out here. Can't be guarded right now. Jordan Poole is nasty. I can't even desribe this shot he just hit. Michigan has been tracking class of 2017 forward Isaiah Livers closely over the last few months. The Kalamazoo native has played well this summer and shown the ability to hit shots at all three levels. He recently Scout.com that he’s expecting a Michigan offer the 1st week of August. John Beilein and Tom Izzo both watched Kevin Easley in Milwaukee over the weekend. Easley is set to make a return visit to Ann Arbor in August for Michigan’s College Practice Camp. The dynamic shooting guard had an easy day in the Playground Warriors’ win over the Midwest Wildcats. If defenses are going to leave him uncovered, the game will be over quickly and Herro made the opposition pay. He went off for 18 points in the first half and finished 20. Even when guarded well, Herro has the ability to hit some unreal shots. His handles are some of the best in the country and even when the defense is draped on him, Herro and second and third moves or fakes in his back pocket just in case. One of the nation’s best pure shooters, Herro has also greatly improved his quickness and bounce. He’s a special player in transition and has the ability to play above the rim as well. Beilein was spotted watching Herro along with Tom Izzo, Greg Gard and Steve Wojciechowski among others. Michigan has been tracking 2017 PG Eli Brooks very closely, but the Pennsylvania-based guard picked up a key offer from Villanova on Sunday. Brooks had previously mentioned that the Wildcats were his dream school and they could be tough to beat. Beilein watched Brooks, as well as class of 2018 guard Cormac Ryan, over the weekend at the Hoop Group Jam Fest. Beilein also stopped by the Brawl for the Ball in Grand Rapids over the weekend where Brandon Johns (2018 offer), Jaren Jackson (2017 offer), Thomas Kithier and Darius Bazley — a 2018 now receiving interest from Michigan — were some of the top prospects. 7-foot-1 Moses Brown has reported a Michigan offer, but hasn’t visited Ann Arbor yet so that report is presumably premature. Wade went off and almost wouldn’t miss during Saturday’s loss to the Kevon Looney Running Rebels. The defense was draped all over him for much of the game and it didn’t seem to matter at times. The 6-foot-1 combo guard doesn’t need a lot of space to operate and can drain triples from way beyond the arc. Wade does a nice job of moving without the basketball and uses a series of fakes once he gets it to fire off a shot. He finished with a game-high 21 points in the loss.